Just when you thought you'd finished your regular workout routine, now you have another muscle to exercise. 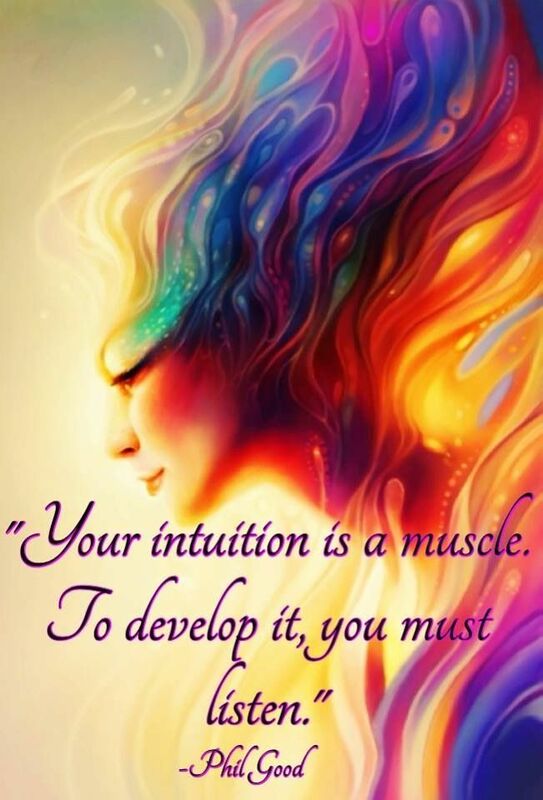 Your intuition muscle! So how can you do that? “Theta brainwaves can be targeted to improve meditation, induce deep but focused relaxation, improves creativity and your ability to learn. Theta-attuned music is some of the fastest ways to produce results.” Anything composed by Steven Halpern is great intuition workout music! Notice repetitive signs and symbols for five days. (Five is the number of change.) Write down everything that repeatedly shows up like numbers; license plate phrases or; recommended books. Record the time. Then after five days, reflect on how you feel about these journal entries. What patterns do you see? Keep track of future hunches in your Intuition Journal. This might include things like: you knowing what someone was going to say; who was going to call you or; that you were receiving some money. Then compare and see how often your hunches were right! All of the pain-free exercises listed above are a part of this system. This writing is a daily conversation on the page for 17 minutes with your inner self. It could also be with someone you choose to chat with from the non-physical realm like an angel, archetype, or ancestor. A pre-sunrise practice of mine for eight years, my soul is grounded through this 3-step process of combining ritual, meditation, prayer and writing. There are more exercises for developing your intuition muscle. And for now, like any exercise program be sure to go slow, be gentle, and exercise consistently! I love this concept Lore of thinking of your intuition as a muscle. I give mine regular workouts! Thanks....I know your intuition muscle is in great shape, lol, Lisa! Once the intuition "muscle" is well developed, you start to see it become inner wisdom. I couldn't imagine navigating through life without that connection! Thanks for sharing these simple ways to kick-start the process. It definitely takes attention and practice. Yes, Halpern's music is lovely to put on when writing or creating, Suzie.